On 21 February ice crystals filled the air in Rumyancevo, a suburb of Moscow, and a halo display with relatively strong Moilanen arc was photographed by Alexandr Yakovlev. One of the photos, with unsharp mask enhancement, is shown above. Another photo is also given ( 1 ). 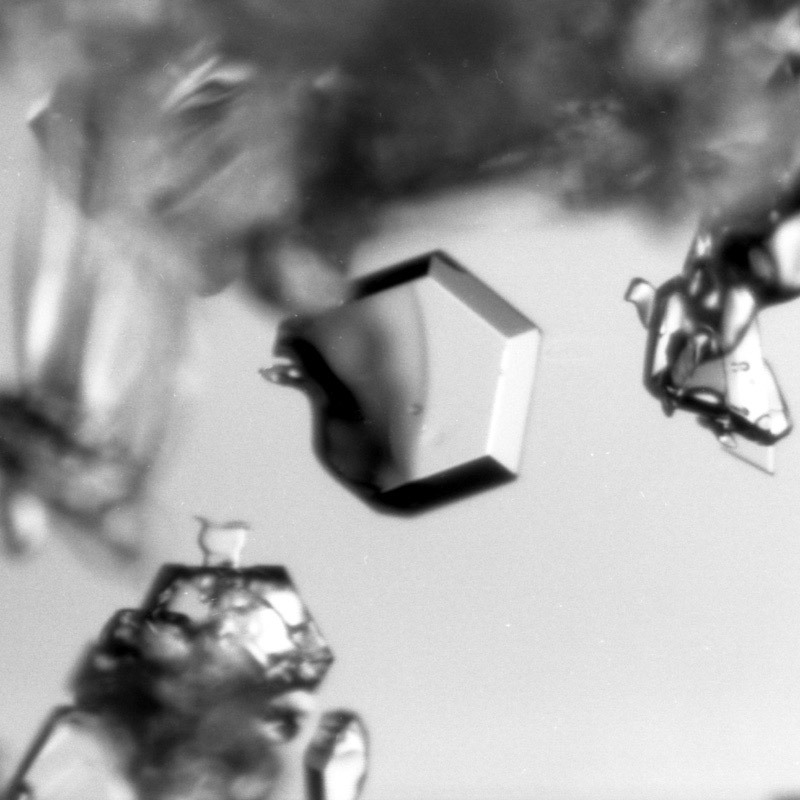 A year earlier, on 1 February 2007 Yakovlev photographed a diamond dust display with subsun and subparhelia from the 7th floor of a building ( 2 - 3 ). In the photos Moilanen arc is also present faintly. An unsharp masked image shows it better ( 4 ). The original images of both displays are available on my blog ( 5 ). 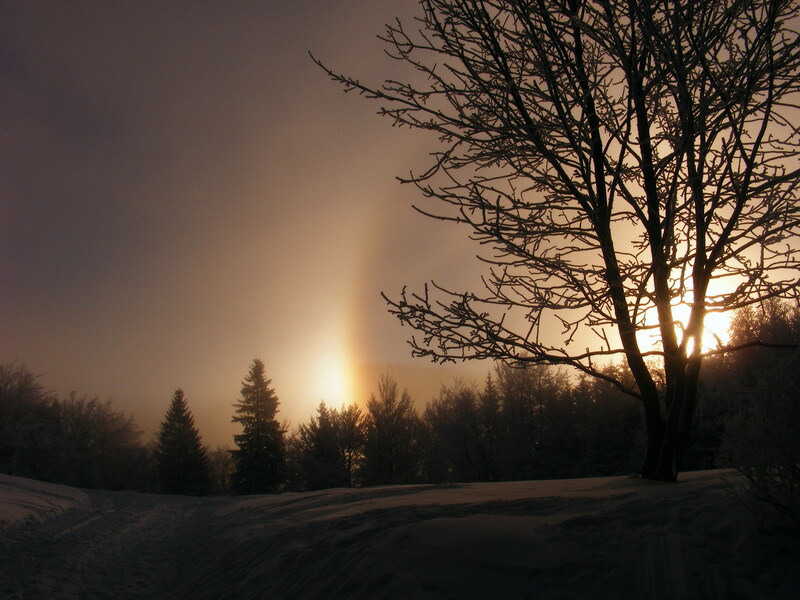 On 29 December 2007, Radomir Vondra observed a complex diamond dust display above an inversion cloud layer. 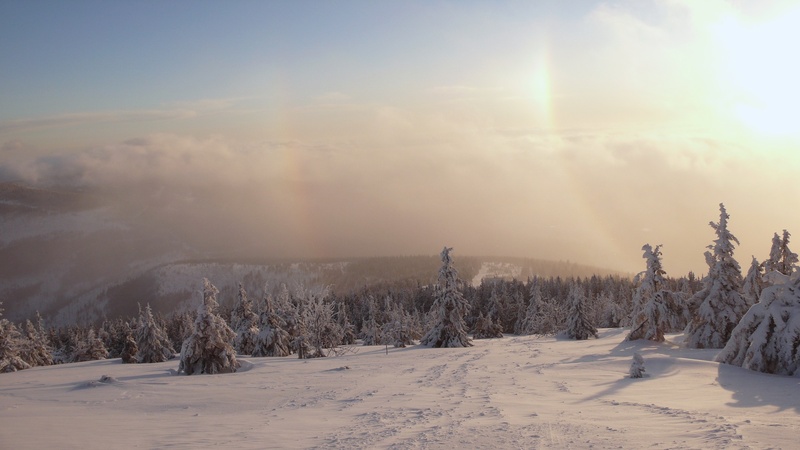 He was walking to the ski slope in the village of Dolni Morava, when he saw the halos between 12:30 and 13:00. The elevation of the Sun was about 15 degrees above the horizon, and the dominant phenomena that first appeared were the parhelia and a bright circumzenith arc. 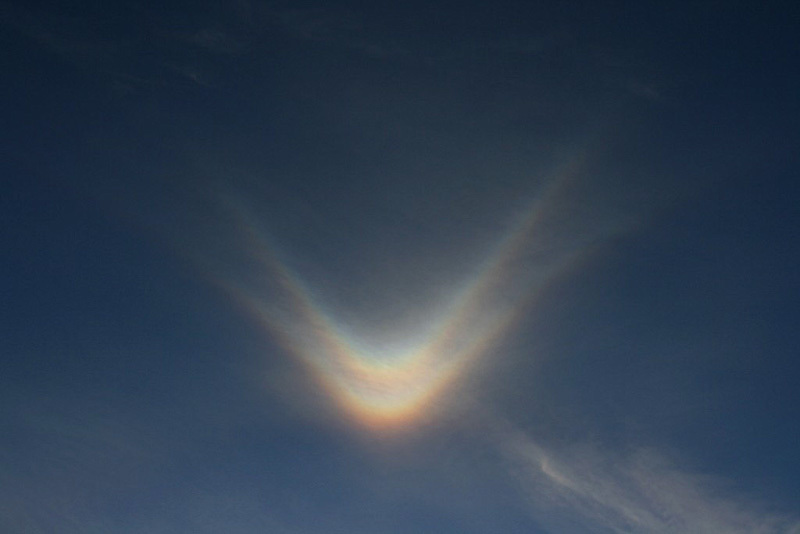 Later, after the sky got clearer, a suncave Parry arc appeared above the upper tangent arc. An unsharp masked version of the photo is also available ( 1 ). 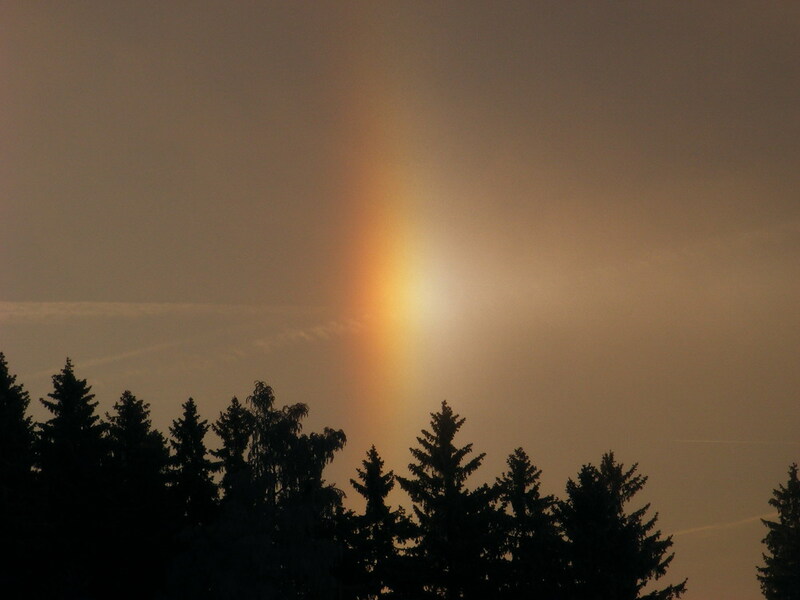 On the same day, Matej Lebl observed well-defined parhelia in Rokytnice nad Jizerou ( 2 – 3 ). On 3 February, Milan Osecky observed a diamond dust display with sharp Moilanen arc by the village of Zaton. 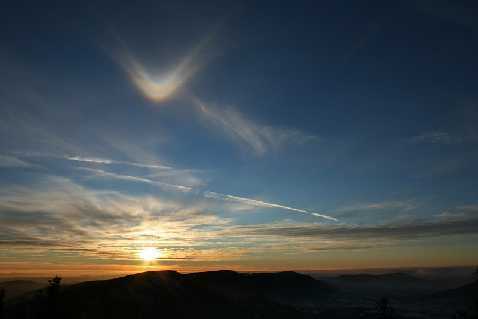 The halo was seen during sunrise, when the Sun was about 4° above the horizon. The phenomenon lasted approximately 8-10 minutes, starting at 8:05 and disappearing completely by 8:15. Also a diffuse sunvex Parry arc was observed, which was a bit difficult to distinguish from the upper tangent arc due to the fuzzy border between these two arcs. 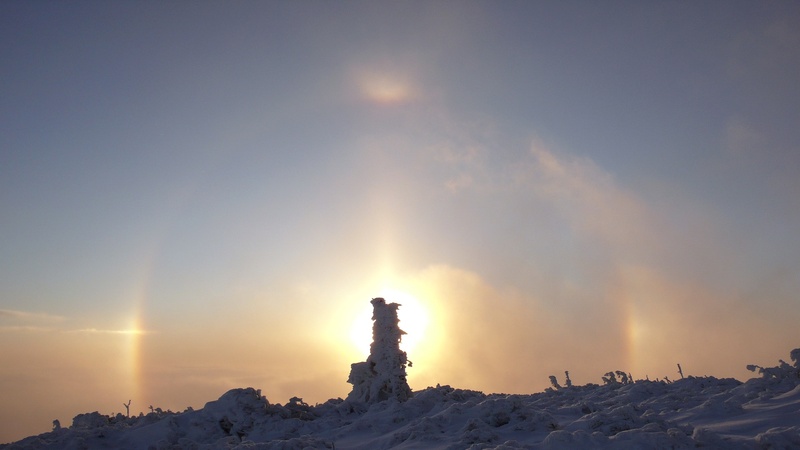 On the same day, Martin Nekola saw halos on mount Svorova in the Krkonose mountains. 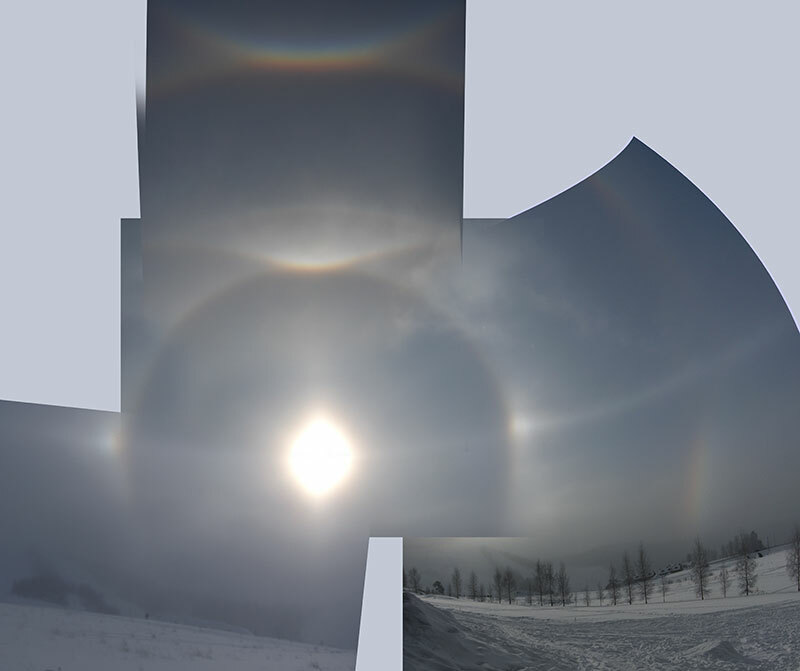 The photos show 22° halo, parhelia, pillars, upper tangent and infralateral arc ( 1 – 2 ). Similarly, Tomas Trzicky in Jizerske hory observed well-defined pillars and upper tangent arcs in the light of street lamps ( 3 ). 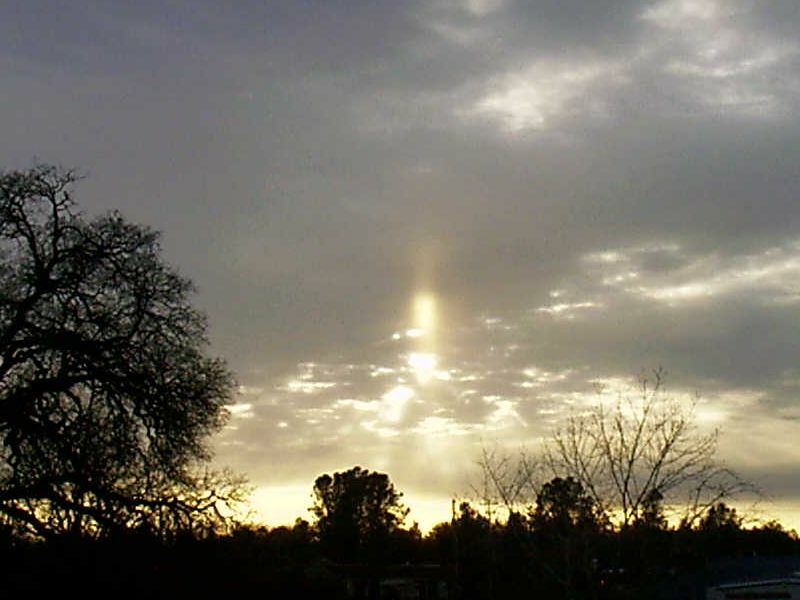 On 1 February, Steve Sumner in Auburn, California, observed a peculiar phenomenon in the sky. 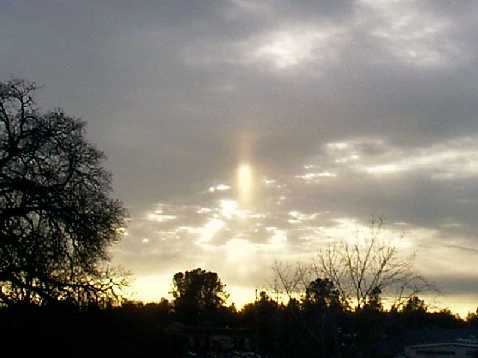 A bright elongated spot, which was apparently not lit directly by sun rays, occurred in front of an Altocumulus cloud. In the photo the Sun's rays projecting downwards from small openings in the cloud layer reveal that the Sun is positioned behind the cloud at the same location as the spot. The other photo of the display should stand here, as well, for comparision ( 1 ). 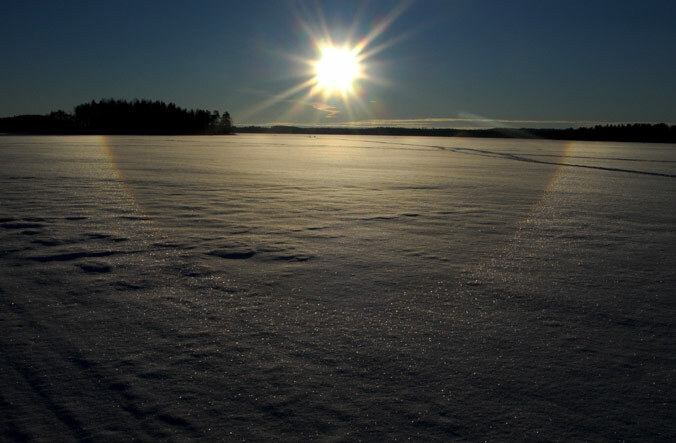 This phenomenon is the reflection subsun, a rare halo of which only two previous documentations are known. 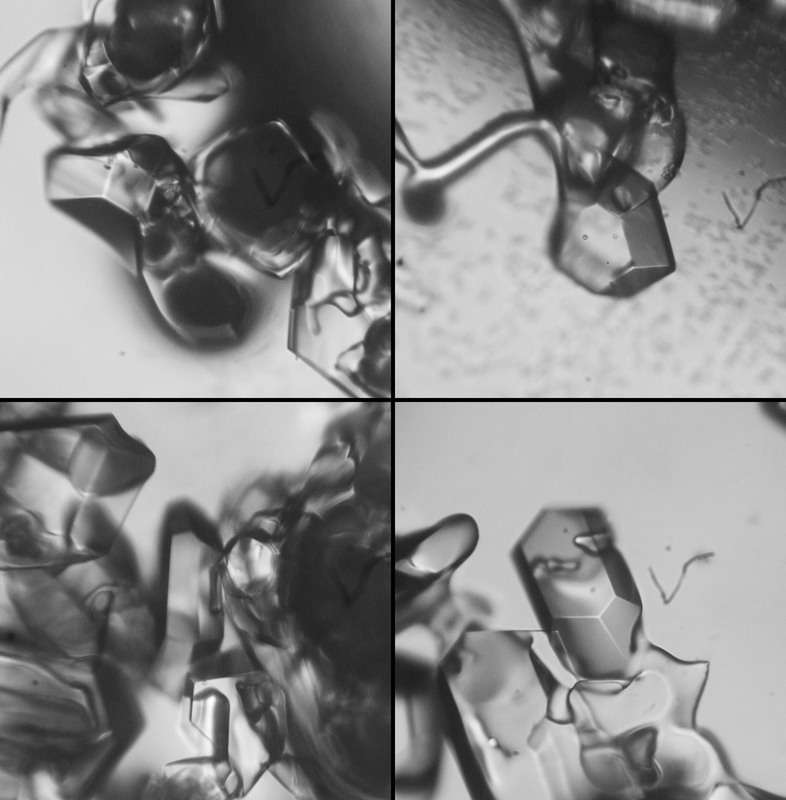 Its formation involves two reflections from horizontal surfaces: the Sun rays are first reflected on a body of water, and then again on plate crystals in the sky, which precipitate from the Ac cloud that blocks the Sun. This way the reflection subsun is seen just where the Sun should be. Identifying the reflective surface was not obvious in the beginning for Sumner. 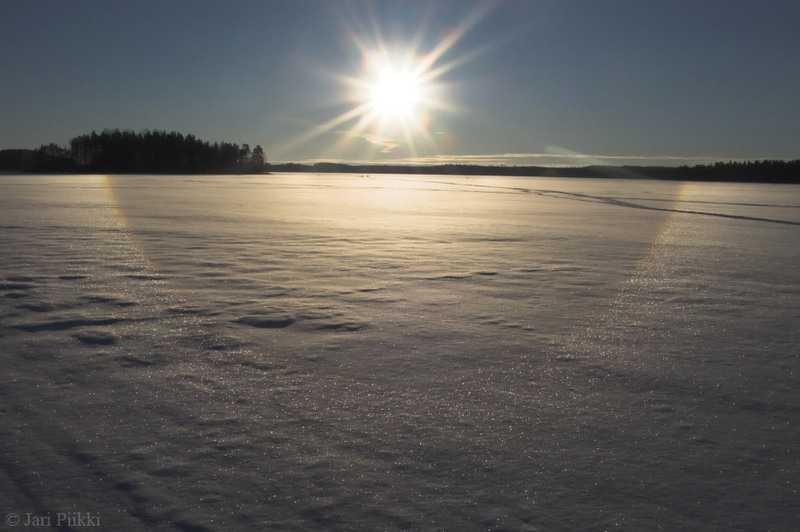 "I could not figure out for a long time where the body of water might be that would reflect the sun in such a way that the halo could appear," he wrote. Then he remembered a place called Yolo Bypass, a large area to the west of the obsering site that is designed to flood during the winter and spring. "Due to the heavy rains we have experienced over the last several weeks, the bypass has been filled with water, and that must be the source of the required reflective surface," Sumner said. 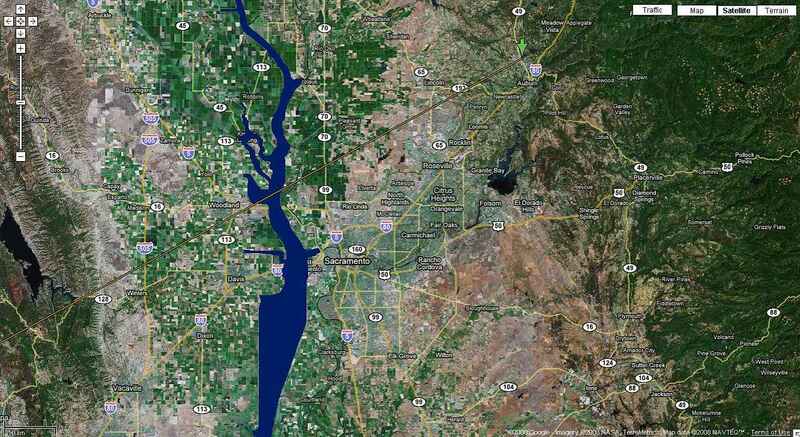 In the map linked, the green arrow marks the point of observation, the yellow line starting there shows the Sun's direction, and the large blue area that it intersects is the Yolo Bypass ( 2 ). 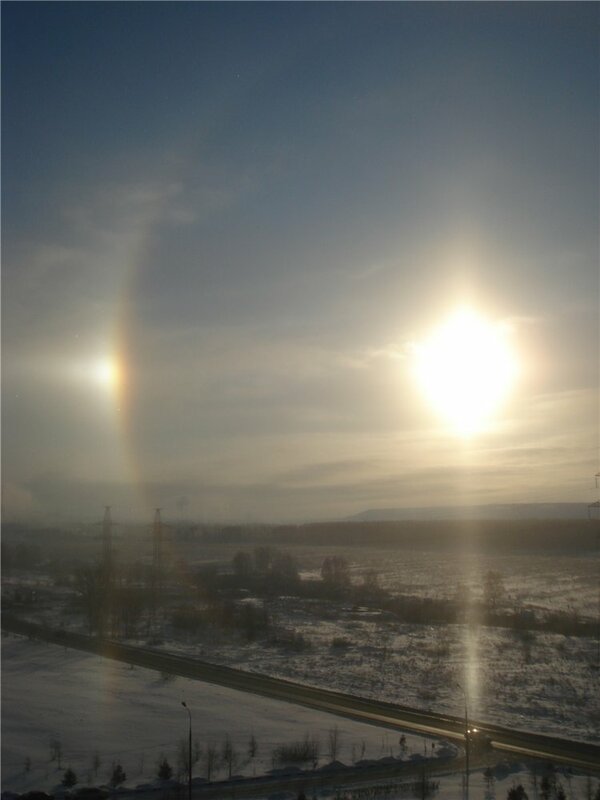 Knowing that the Sun was at 6.5° elevation during the observation, and assuming that the Yolo Bypass at 56 km from the observing site was the primary source of light for the reflection subsun, Sumner calculated that the ice crystals were at about 3500 meter elevation, which is an agreeable value for Ac clouds. Sumner’s photograph adds the third documented case of reflection subsun. 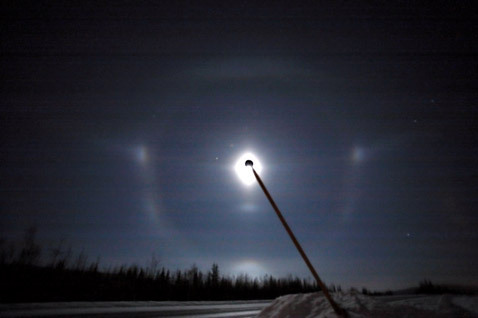 Earlier, in Finland, Jarkko Korhonen had photographed such a halo in Oulu in October 1998, and then Jenni Elina Holopainen on 18 May 2006 in Pyytivaara ( 3 ). For some years I have been waiting to get to employ stacking technique for snow surface halos. Last weekend the chance finally came along, as a moderate display appeared on two consecutive days. Here I present the results from the first day. 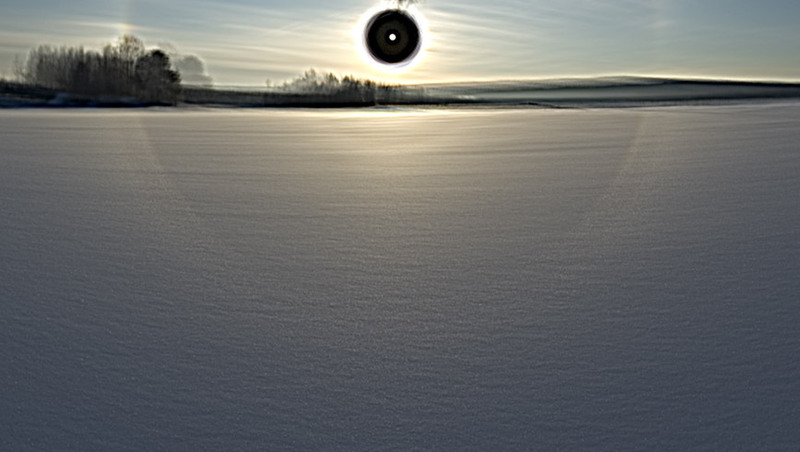 The image above is stacked from 118 images which were taken on a frozen river in Rovaniemi. Between each shot the camera, which was on tripod, was moved some 20-30 cm sideways. 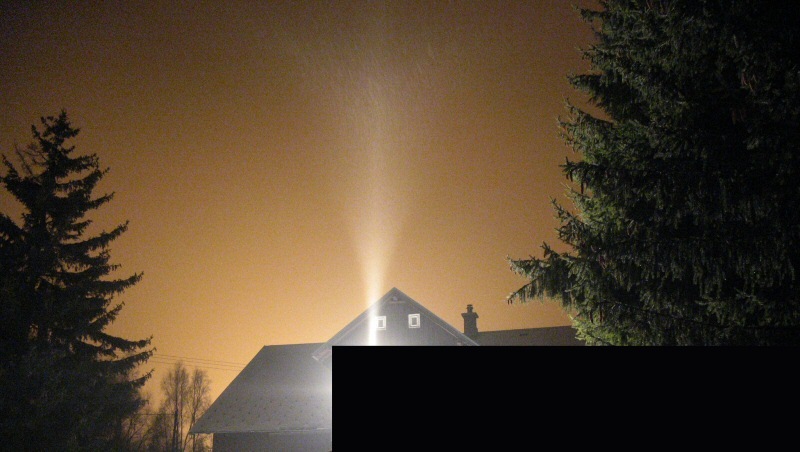 This serves to decrease noise of the snow surface in a similar manner as cloud movement decreases the noise in stacking of sky halos. 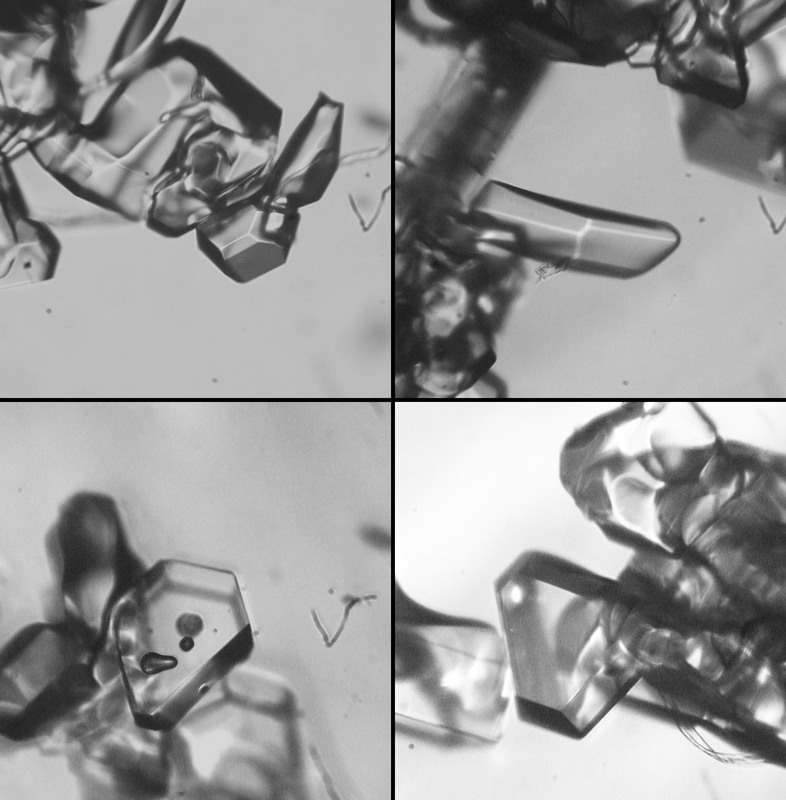 Already on the spot I thought of seeing double structure in 22° halo, indicative of the 24° halo, but was not certain of that until two hours later, when I came back with microscope and saw an abundance of pyramid crystals among normal crystals in samples taken from snow surface ( 1 - 2 - 3 - 4 - 5 - 6 - 7 ). In the above displayd stacked image the 24° halo is conspicious and also a close up image is given ( 8 ). 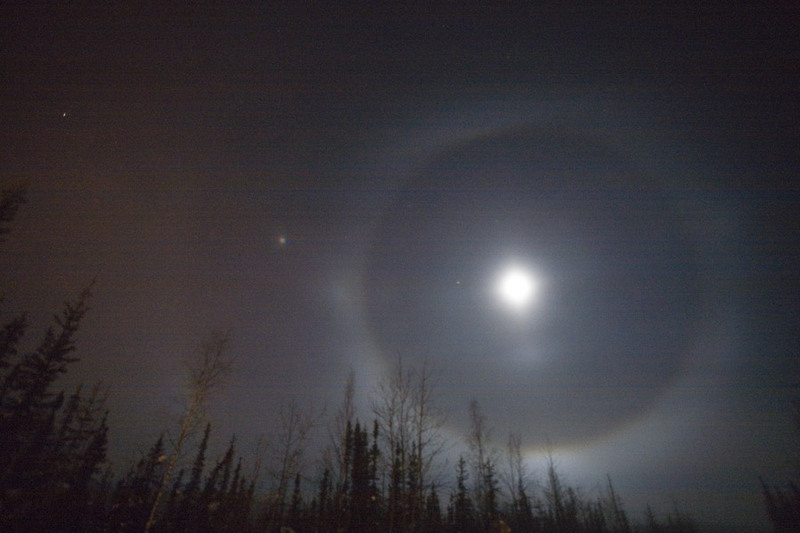 24° halo is seen also weakly in single unmanipulated images ( 9 ). 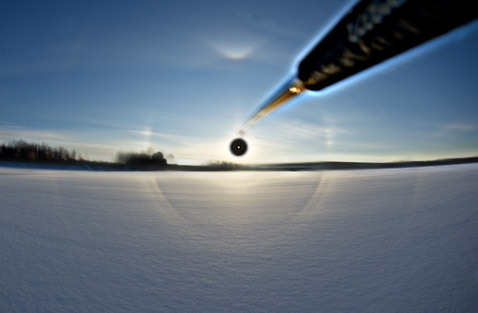 9° halo, which should be always occurring with 24° halo, is not visible in single images, but appeared in stacked image, and is seen perhaps best in an image that has only light unsharp masking ( 10 ). 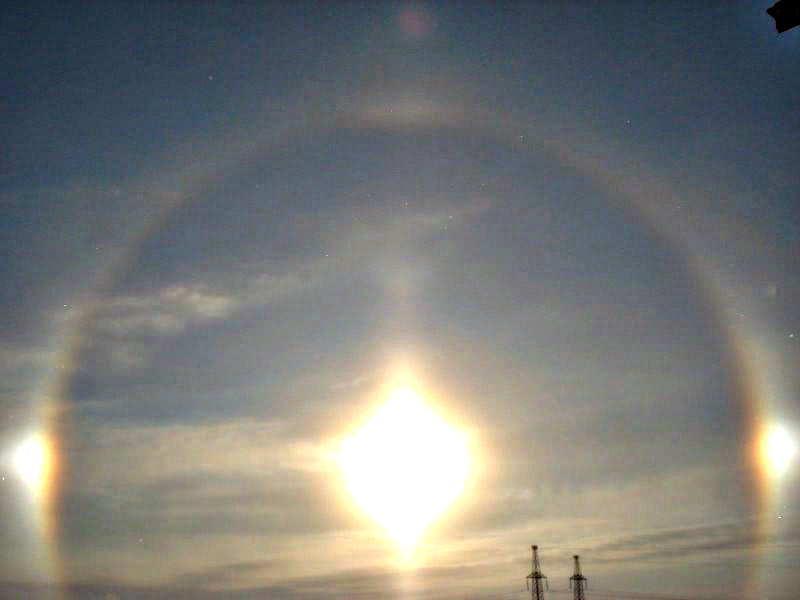 Heavily unsharp masked version resulted in 35° halo appearing faintly ( 11 ). At 86 frame stage I could not yet detect it, so additional 32 images made a difference. 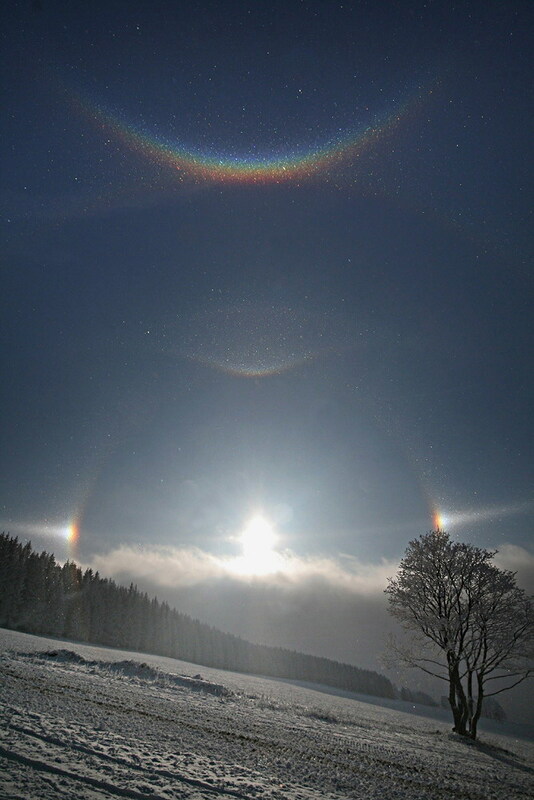 In sky displays 35° halo is always associated with 20° halo because they are closely related in formation. As a thumb rule, one can have 35° halo if 20° halo is intense enough. Here, however, it seems that there is no 20° halo or at most a ghost of it is present. 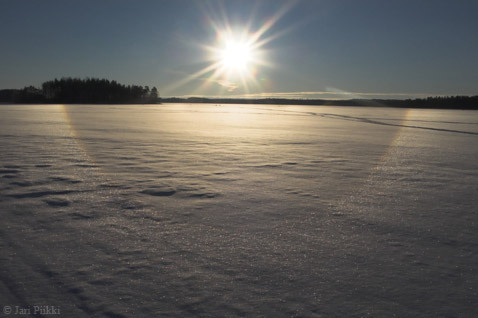 Possibly the alternate pyramid faces, which make the 35° halo, are represented in the special snow surface situation in significantly greater proportion in relation to opposite pyramid faces, which make the 20° halo. The lowest temperature measured at the official station in the city center was -12°C at 9 in the morning, three hours before I noticed the phenomenon. 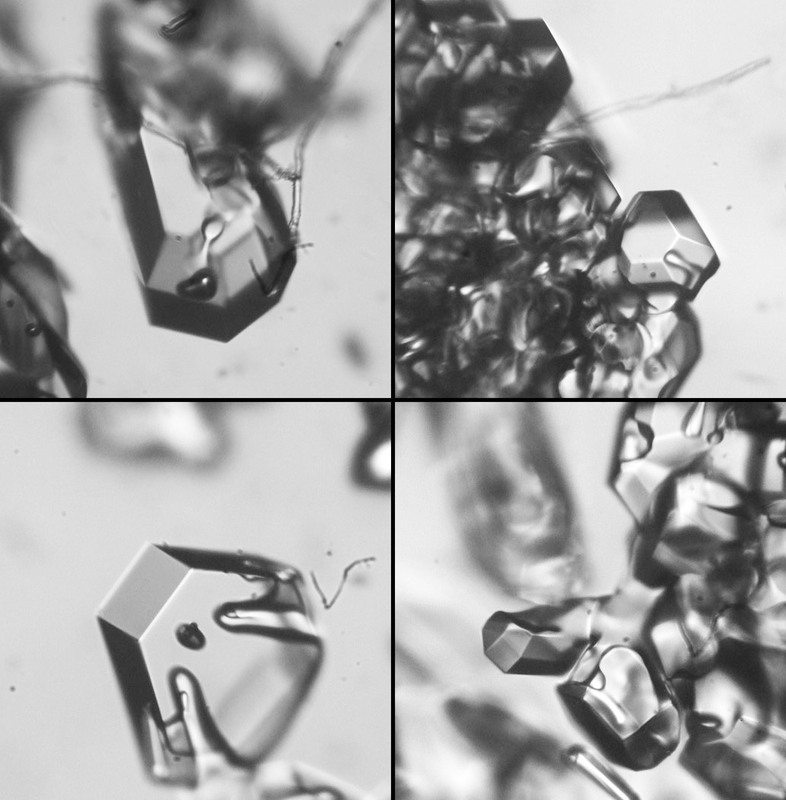 This is not quite enough for pyramid crystal formation as far as airborne crystals are conserned, which start occuring below -20°C. However, down on the river ice away from the city center and especially on the few centimeters above the snow surface (clear sky) it can have been cold enough for pyramid crystal formation. 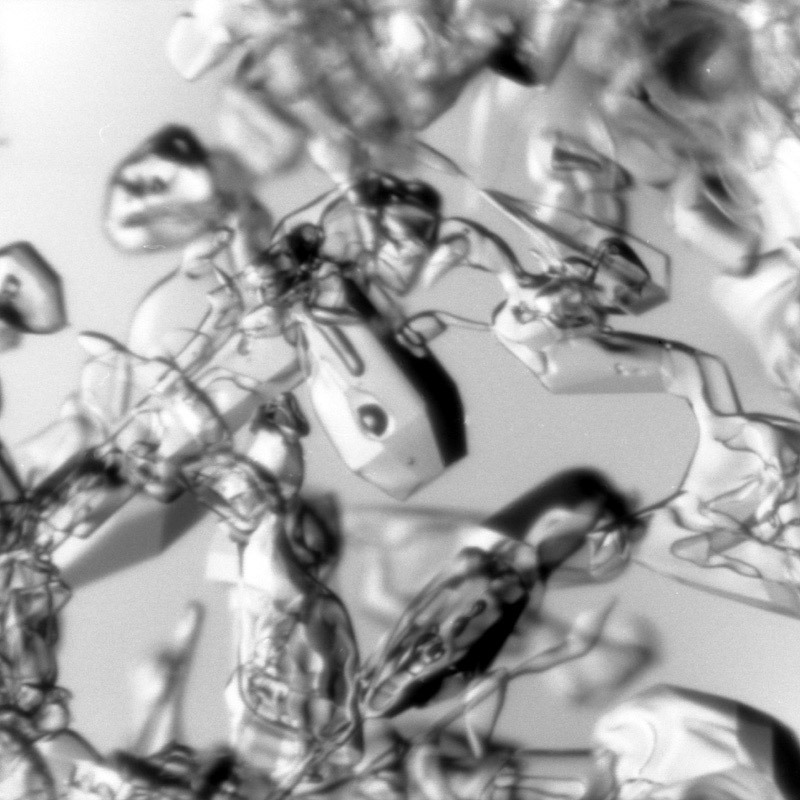 Could be also that snow surface presents a special situation where not as low temperatures are required as with airborne crystals. 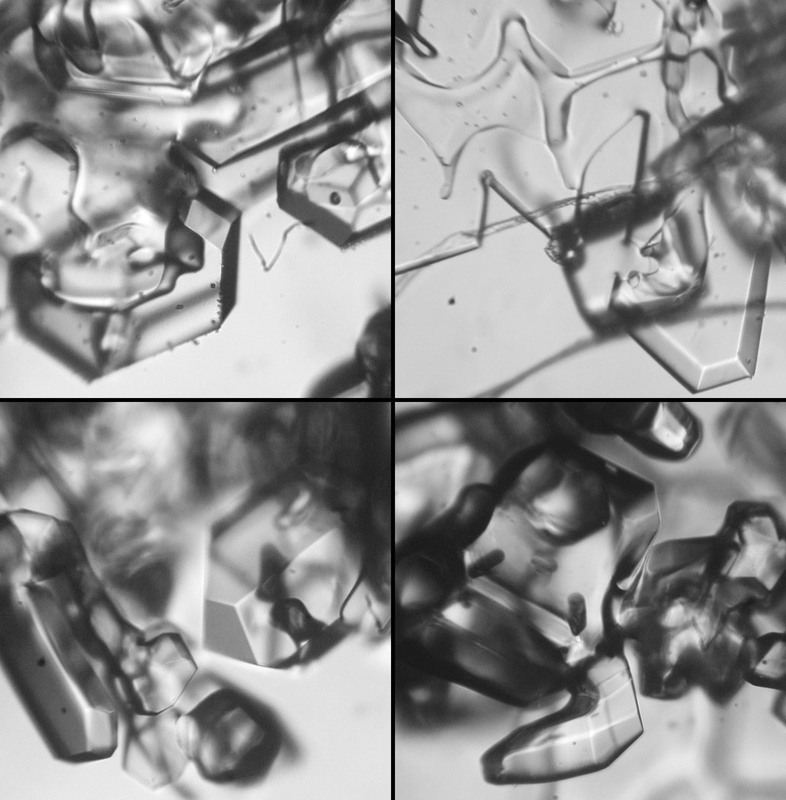 The crystal photos are all in same scale, the width of each square is approximately 0.6 mm. 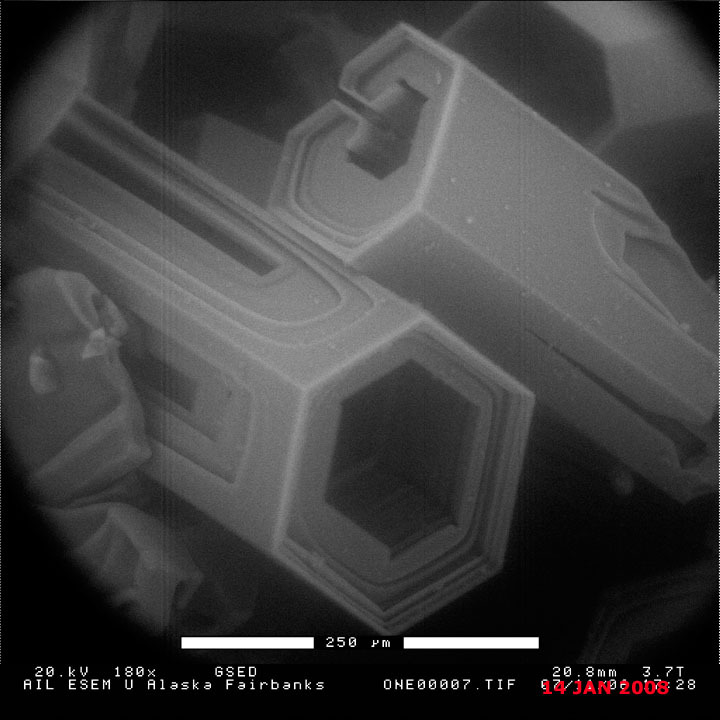 The next day the display looked slightly different but pyramid crystals and odd radius halos were still present. I took 350 photos but have not worked on them yet. 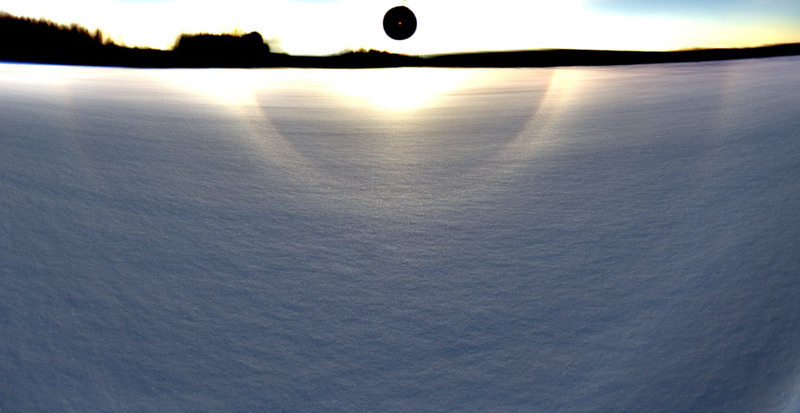 Sometimes a surface halo can be more than a couple of colored crystals forming a vague half circle on the snow. 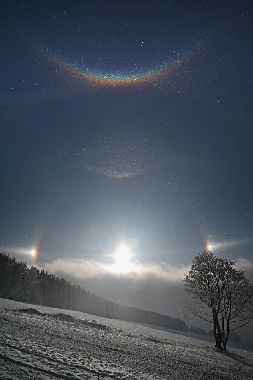 Such was the case on 8 January 2006 in Juva, where Jari Piikki photographed the display shown above. 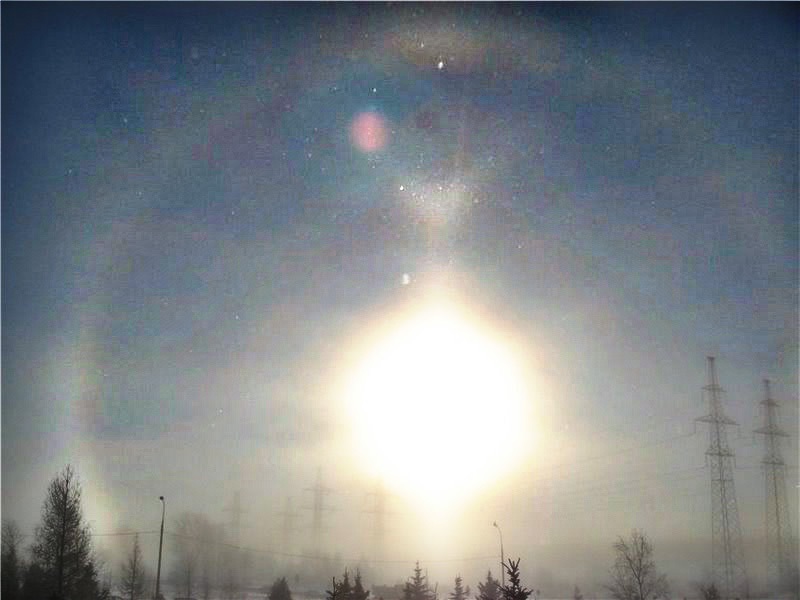 22° halo is the dominating feature, but closer look reveal also halos from pyramid crystals. 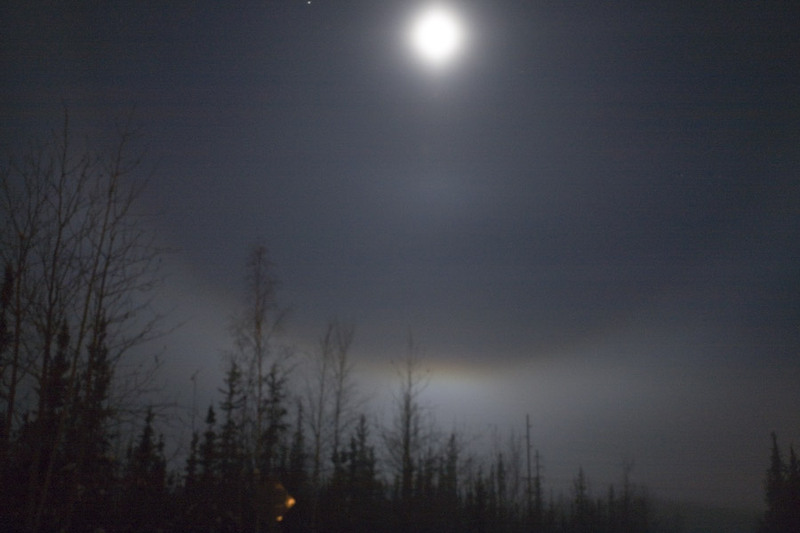 In darker version of the same image 9° halo is visible and a short patch of 24° halo is seen on the right where the 22° halo meets the forest ( 1 ). 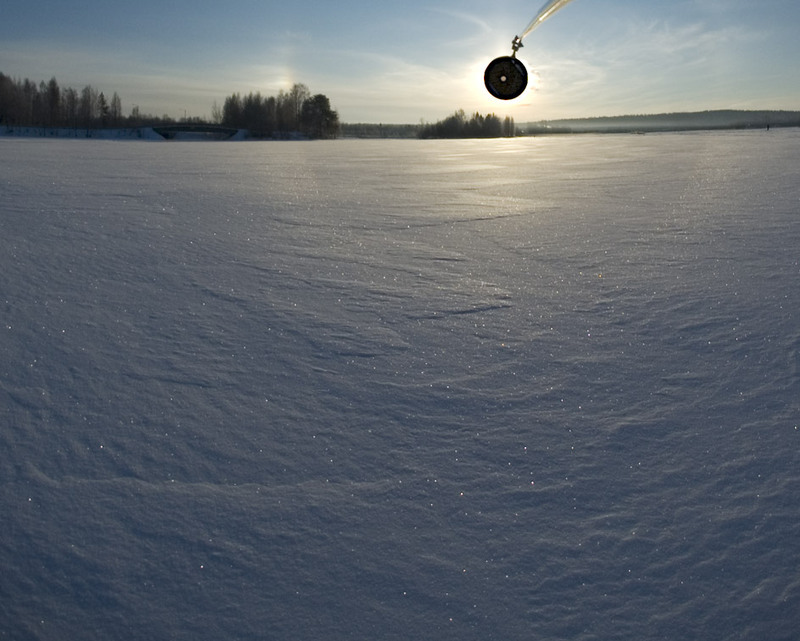 Earlier, an odd radius halo had been observed on snow surface in Germany, where Richard Löwenherz saw 24° halo accompanying the 22° halo on 10 December 1998 ( 1 ). 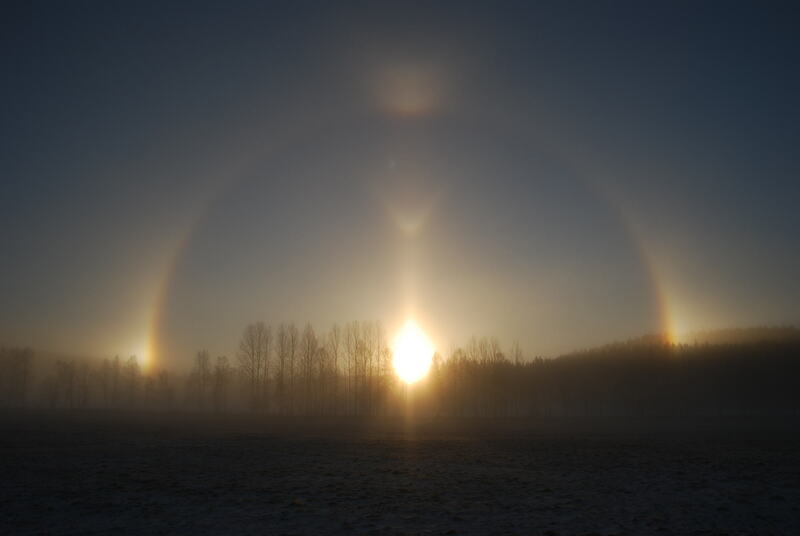 On 3 December 1986 in Kuopio, Finland, Juhana Hakumäki observed 9° and 22° halos on frosty window. 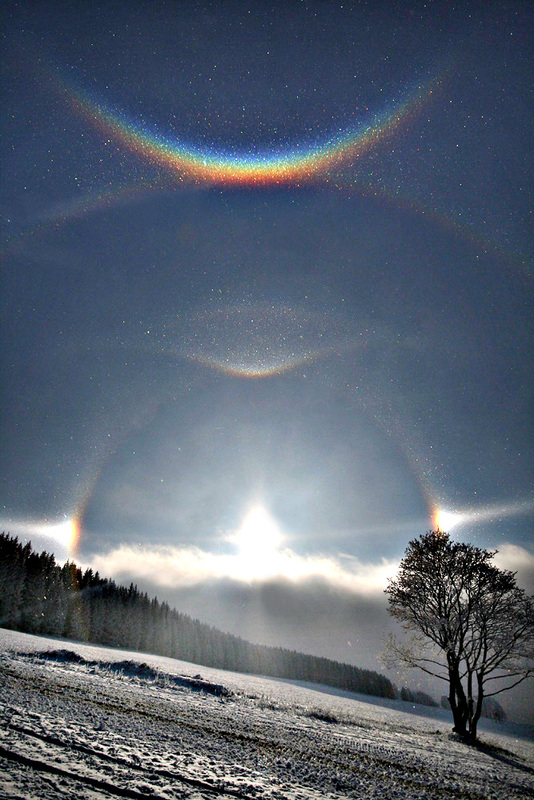 The 22° halo was reported to have double spectrum, an indication of the presence of 24° halo. 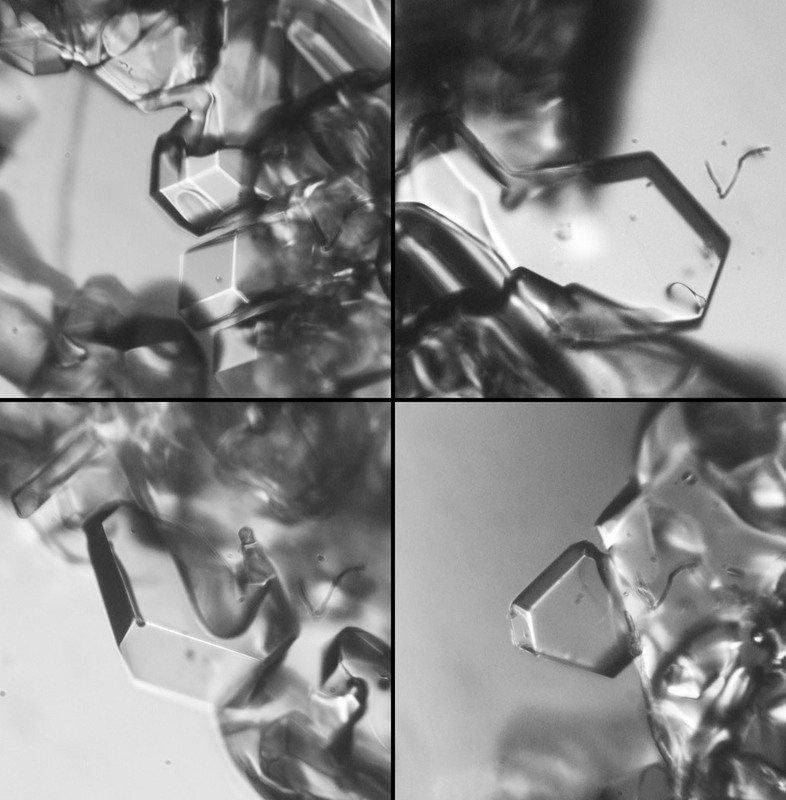 Crystal photos from surface halo displays are scarce and as far as I know none are available from the displays with odd radius halos. 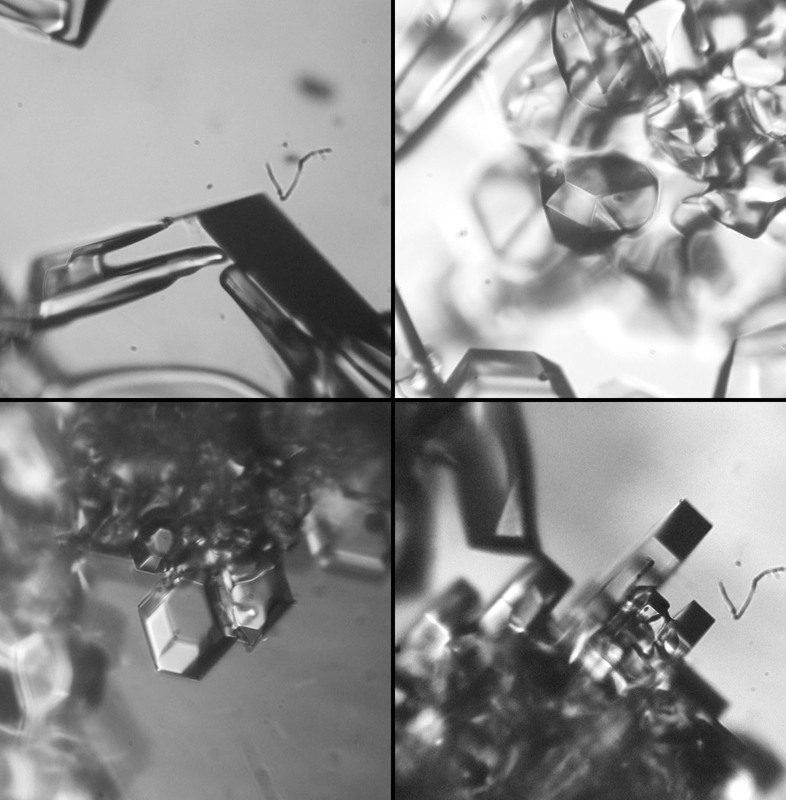 However, pyramid crystals have been sampled from snow surface. At South Pole in December 1998 Jarmo Moilanen decided to have a look at the snow surface composition under a microscope, and to his surprise saw pyramid crystals ( 1 - 2 ). Unfortunately sun was too high to see the possible odd radius halos. 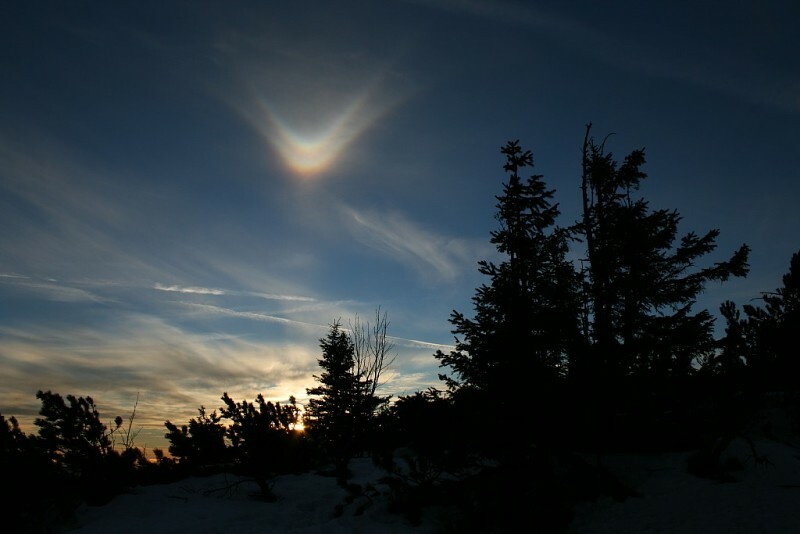 In the evening of December 22, 2007 Emil Brezina had the opportunity to observe halos on cirrostratus clouds from the top of Lysa hora, the highest peak (1323 m) of the Moravian Beskydy mountains. "The temperature was between -25 and -30 °F (-32 and -34 °C). 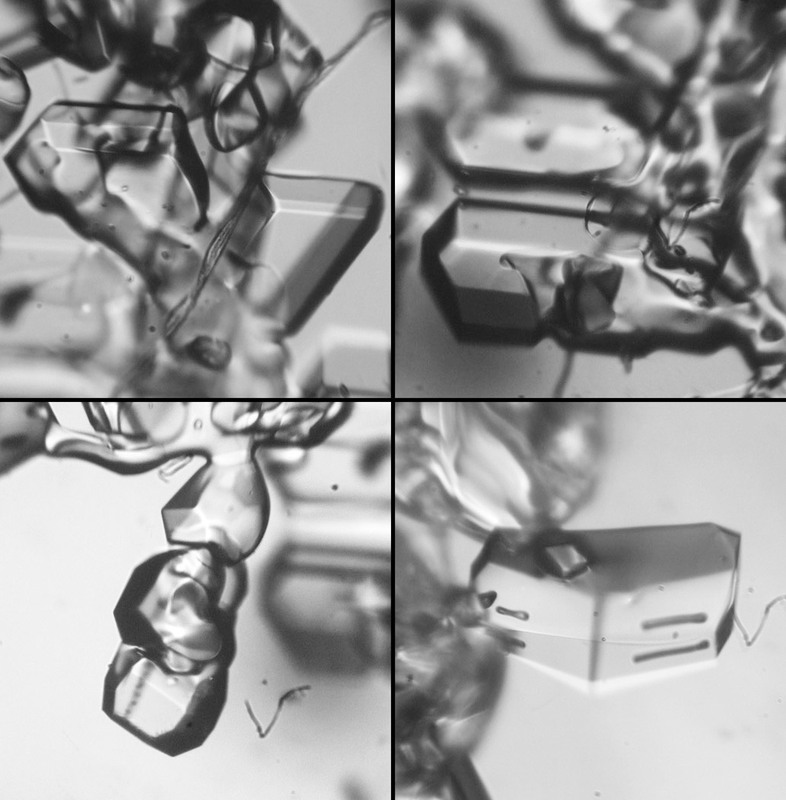 The crystals were probably power plant products, but I am not absolutely certain of that; there was a gap in the crystal swarm that occurred between the main plume and the area of the display. I did not see the 9° or 24° arcs in the spotlight. 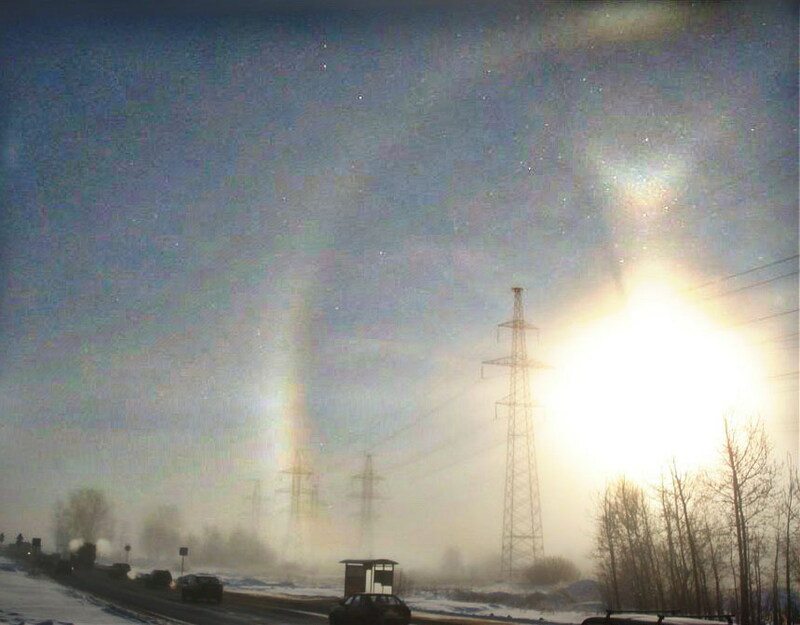 The photo was taken on the main highway between Fairbanks and Anchorage, which was not getting heavy traffic at 5am". Two more photos ( 1 - 2 ).